You also can’t spell “Restoration Hardware” without T-R-E-E-S A-R-E S-H-I-T. OK, there’s an extra ‘S’ thrown in there, but you get the picture, and you hopefully get what Restoration Hardware feels about our forests. I have never been one to preach a green lifestyle: I try to recycle and I usually accomplish it. I have canvas shopping bags in my trunk, and I actually bring them into the store about half the time. But, when I saw the monstrosity that Restoration Hardware sent out, it pissed me off. Have you seen this thing? It’s 615 pages of their overpriced merchandise (don’t they have to overprice? they need to pay for their catalog…) crammed into a 3-to-5 pound shop-alog. What world does their marketing department live in? Are they not onto the fact that, when someone needs a linen storage box, some Italian bedding, or a large leather couch (financing available), they will likely browse online? Yes, when I was a kid, I enjoyed the arrival of the Sears Giftbook just as much as anyone else. But, there was no way for me to peruse aisle after virtual aisle of toys and other Xmas wishes. These days, does anyone really take the time to leaf through 600+ pages of shoppable crap? For shame, RH…you are S-H-I-T.
My Tie du Jour is a vintage thin from Prince Igor, which is probably, safe to say, no longer in business. It was sold by the Maurice L. Rothschild & Co. outfit at one of their department stores. 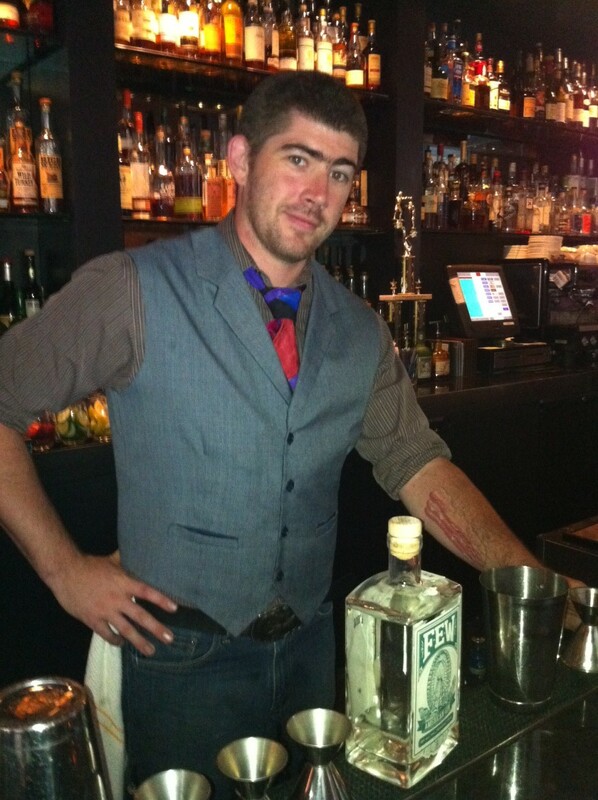 One of the exhibitors (good thing I didn’t say “exhibitionist”) at Indy was a very cool guy named Graham Wasilition, purveyor of Tenneyson Absinthe Royale (which was delicious, by the way…I’m a BIG fan of the black jelly bean). 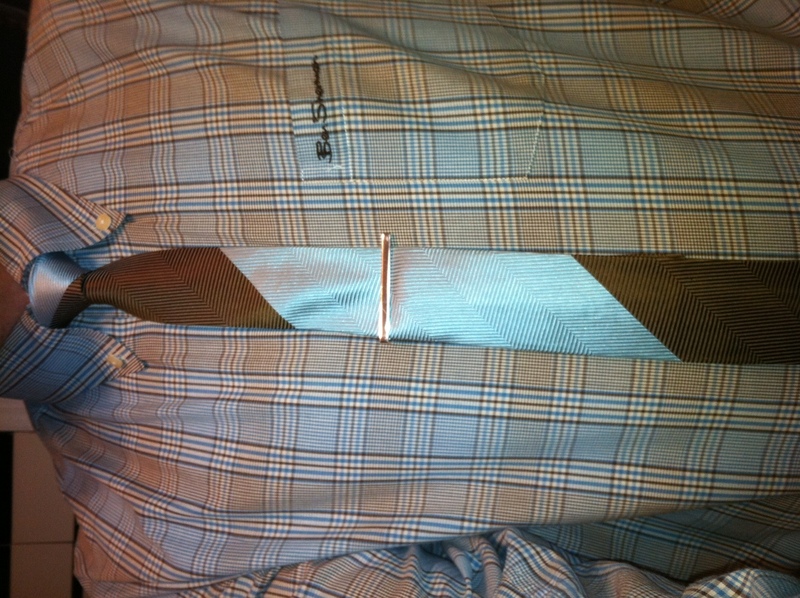 He had some tie-bar/cufflink sets, and he gave me a new tie bar, adorned with the Tenneyson design. 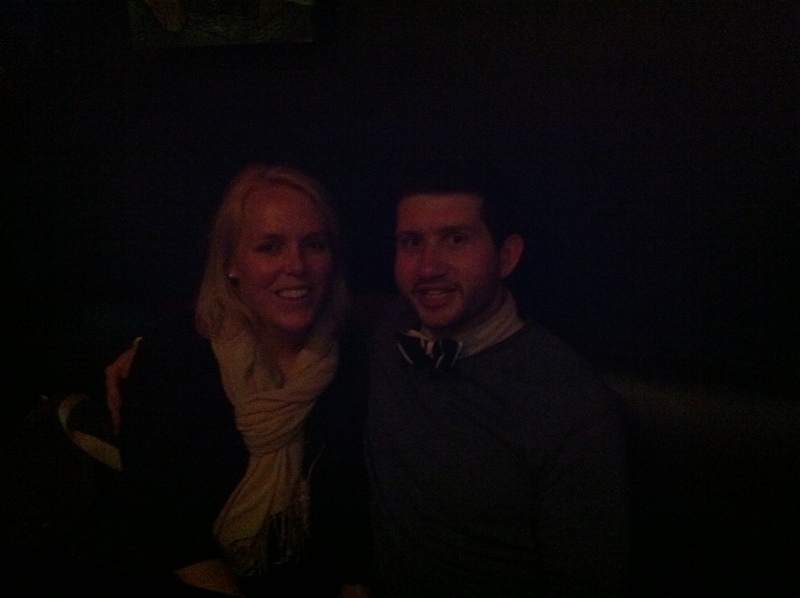 Very cool, so I wore it the rest of the night. Thanks, G.
OK, I’ve done the crime, 20 lashes for me. 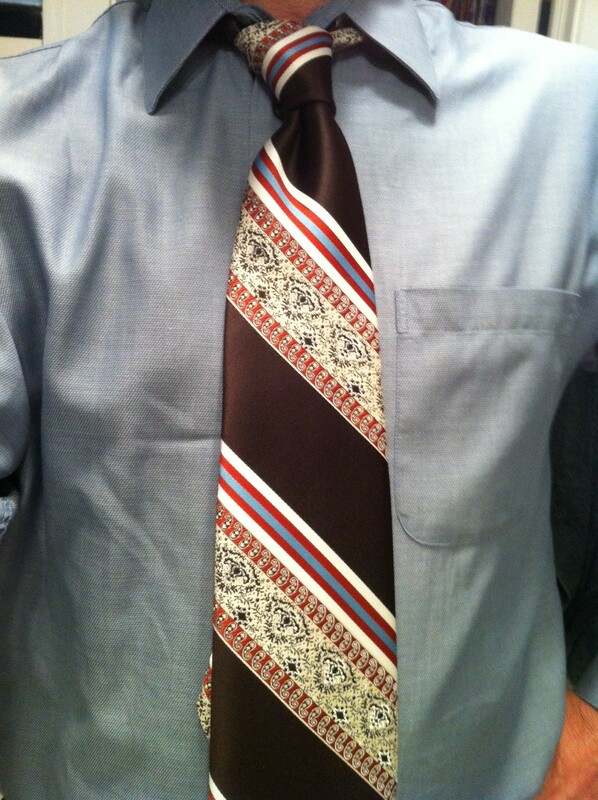 I have officially set the record for procrastinating in posting about a worn tie. It’s been so long I won’t even admit it, but rest assured that it’s been over a week. Plus, I have two more that I need to write about. For shame. Uh, yeah, that extremely long paragraph was penned about 10 days ago, so my break in procrastination was very short. Sheesh. 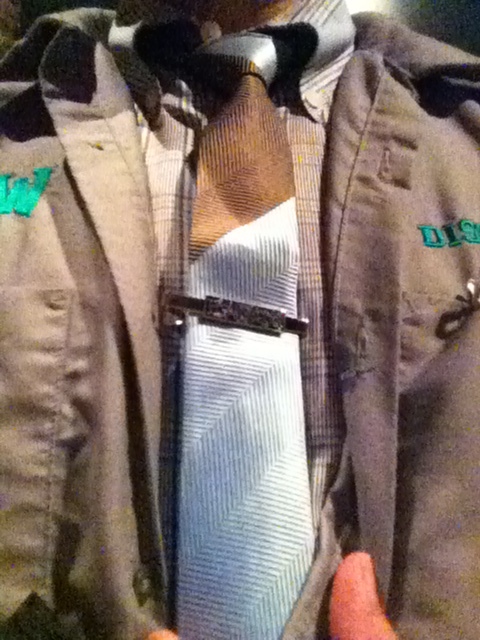 I’m now up to about seven ties that I need to write about, or at least record. Let’s get to them. Or, perhaps I can save this as a draft and sit on it for another few weeks. No, wait, what do we have here? Yes! I’m going on to another paragraph, it looks like the wait is over! We may get to an actual blog post here! We may have a tough couple of minutes while I retrieve my phone, to refresh my memory as to which tie I’m actually writing about. 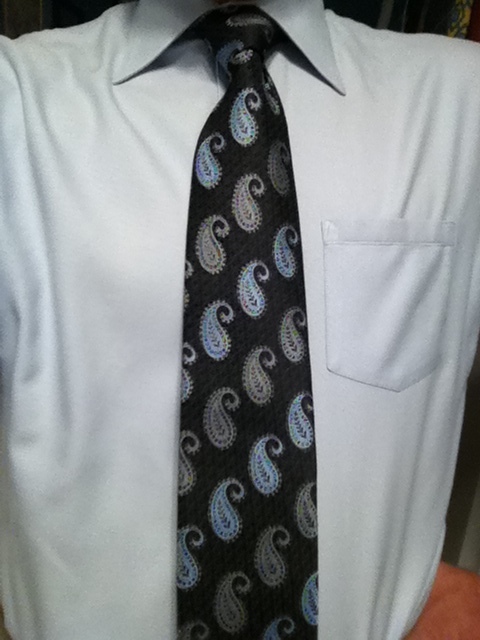 Ah, yes, here we go…I was able to wear this Tie du Jour on my first public appearance with Few Spirits. 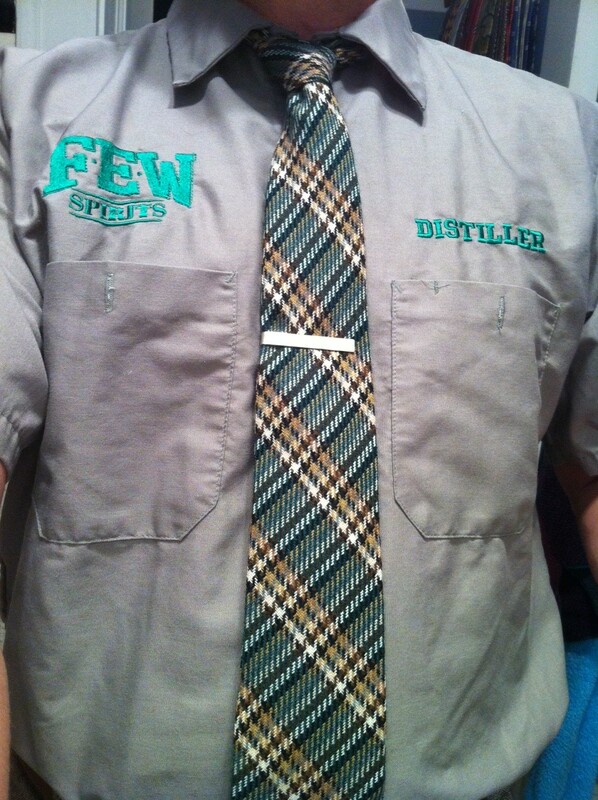 Let me rephrase that…my first appearance with product from Few Spirits. By the way, at press time, Few is sooooo much further along. I’ll try to avoid spilling the beans (or spilling the gin, rather) until I catch up a little bit. The TdJ is from Kolte. 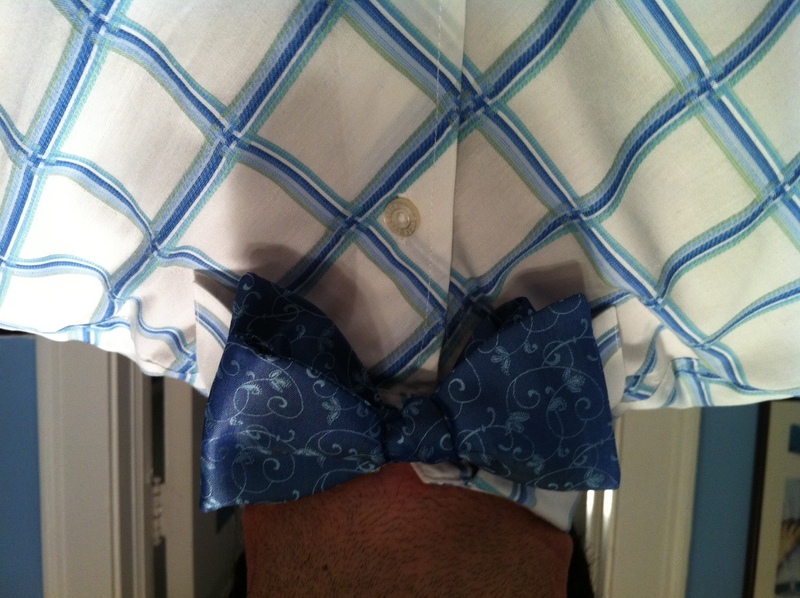 It’s a very dark blue with gray paisleys. It’s very rare to see paisleys marching in such an orderly and homogeneous fashion. Usually they are multi-sized, and swimming all over the dang place. I wore this lovely strip to a gala charity event called Artopia, hosted by the Open Studio Project. OSP is an Evanston non-profit that helps underprivileged kids connect with their artistic side by providing them with art projects. 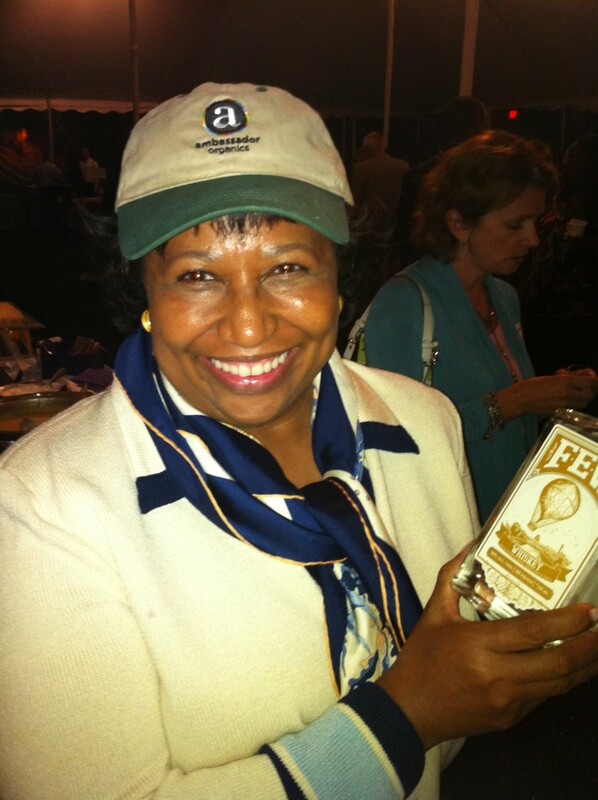 One of the auction items was a bottle of Few White Whiskey, along with a barrel naming. I attended and gave taste samples of the FewWW. How nice, eh? 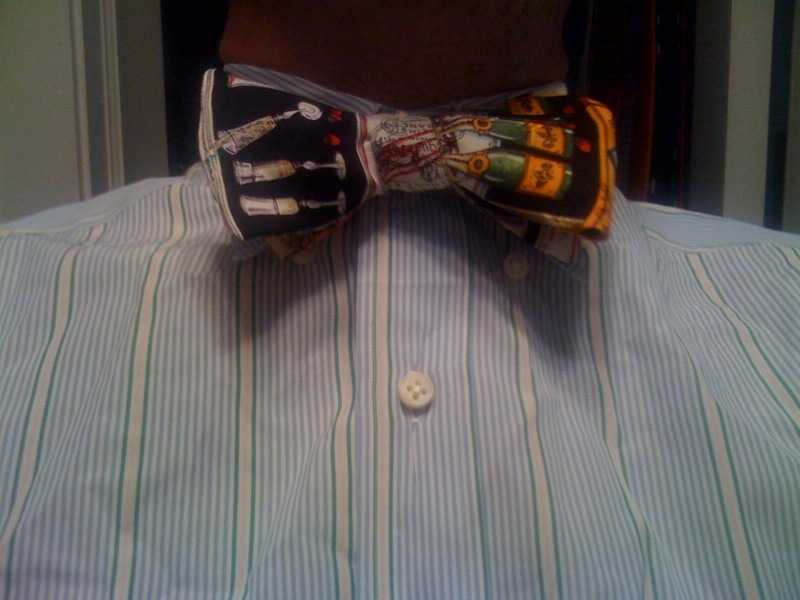 There were a couple of other ties at the event, but they all paled in comparison to this one. 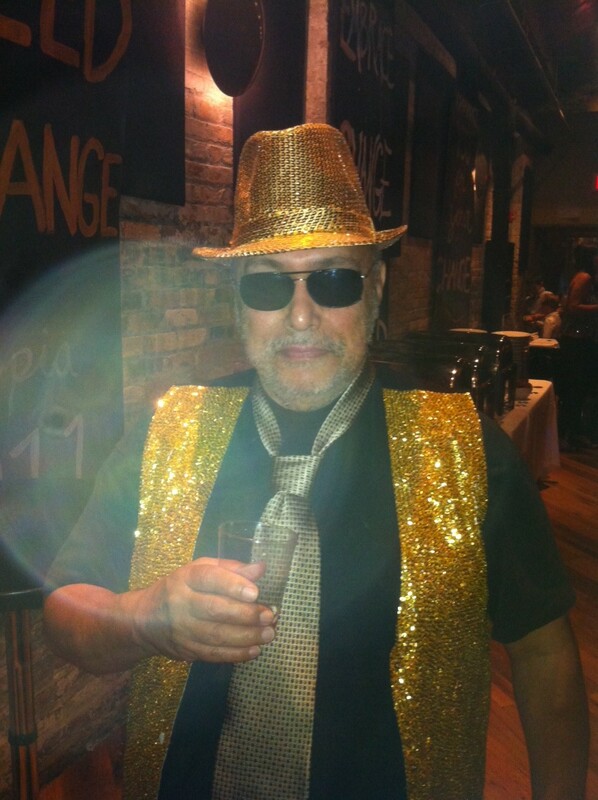 I failed to retain his name, but let’s just call our newest GWT Marty Graw, since he was in his French Quarter outfit. I reached the monumental pinnacle (is that redundant?) of wearing a tie two days in a row, a mere couple of weeks after basically wearing one for 300 days in a row, save for weekends and the occasional Sanity Day. It’s been pretty nice to see that I’m still getting a few dozen page views per day, so thank y’all. 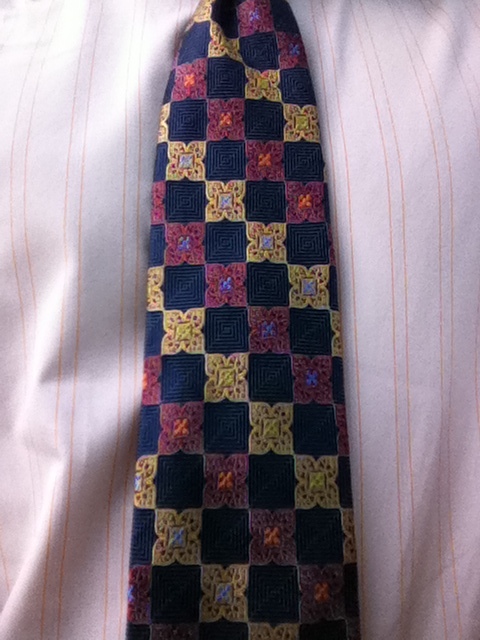 My Tie du Jour was not worn for the full Jour, so it may need to be called the Tie des Deux Heures (2-hr Tie). 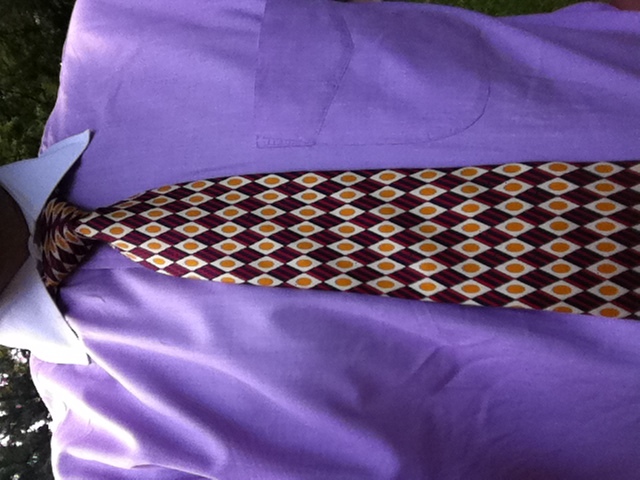 I’m getting the feeling that it may become a regular feature here at 100 Days, 100 Ties. Tie No. 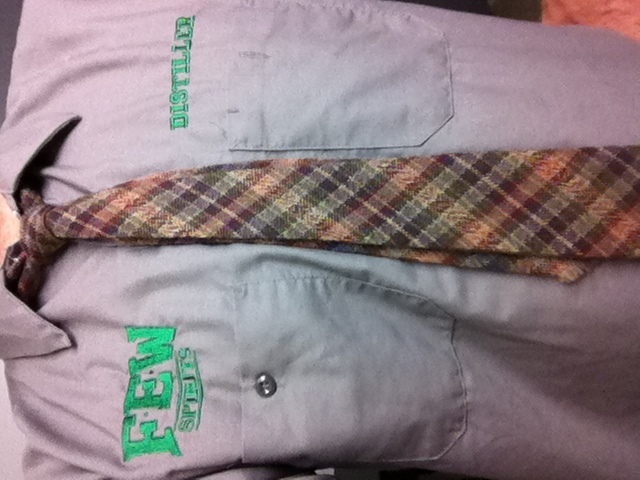 304 was sported, as you can see, with my distiller’s shirt from Few. 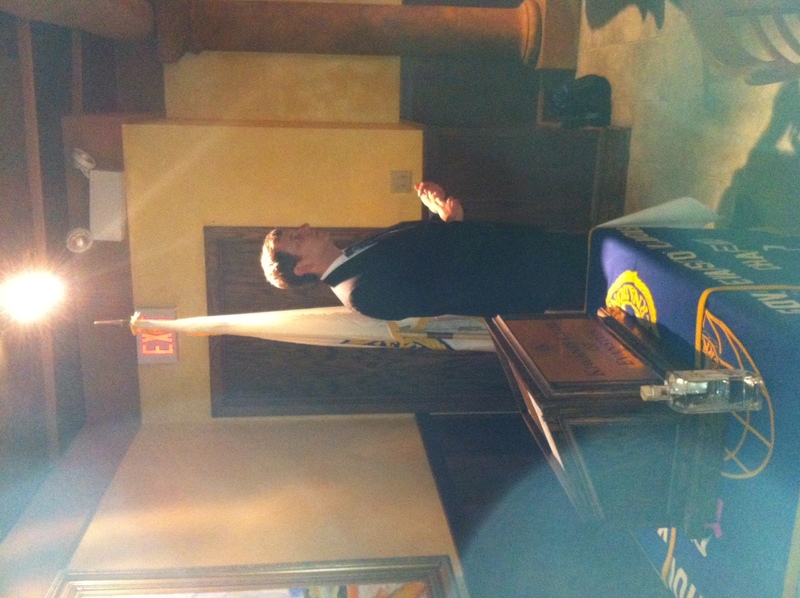 Paul and I were guests of the Kiwanis Club of Evanston, and we gave a short presentation to their members about the new business. This wool strip is from a store called Trimingham’s, a department store that was a fixture on the island of Bermuda. It’s strange in a couple of ways. 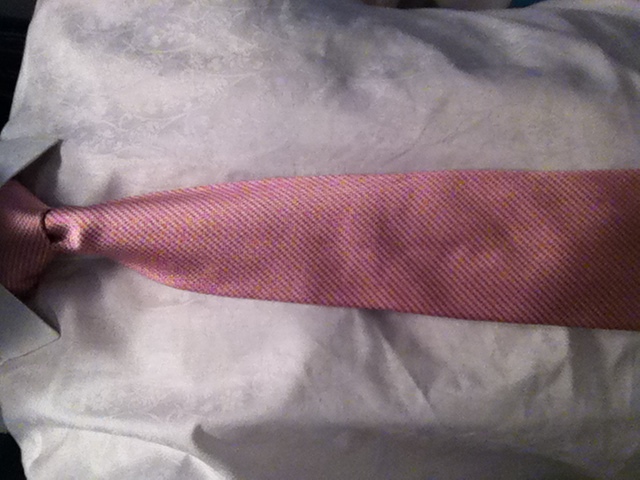 It was the first tie I’ve worn that could have been tied with either end being in the front – both ends were the same width. And, the tips had fringes on them (you can see it a little bit in the photo). Not sure if that is a Bermudan thing, but I doubt that they bother with ties very much anyway. I captured a shot of Master Distiller, and many time GWT appearer, Paul Hletko, describing the magic that happens at 918 Chicago. 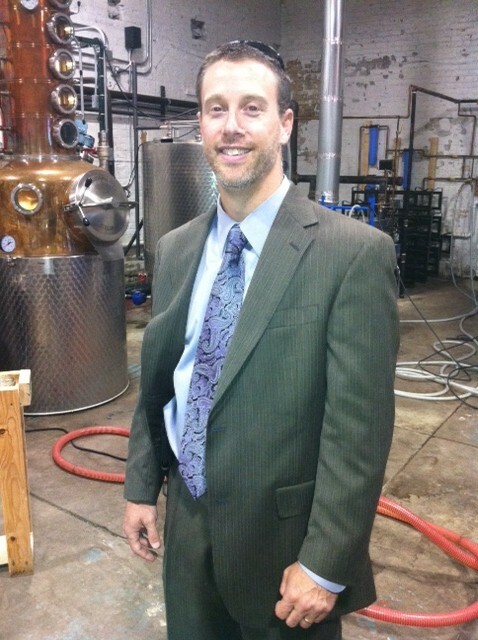 We had a tie-wearing visitor to the distillery. 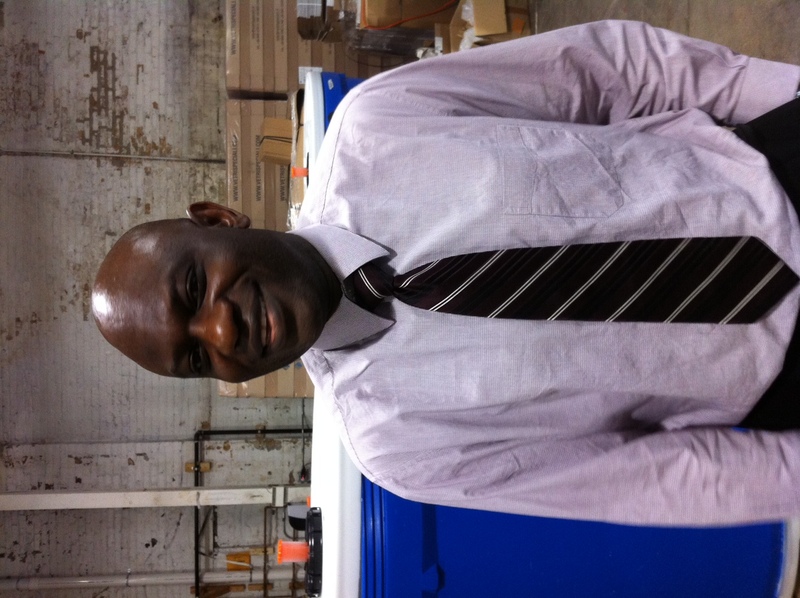 Bayo, who works for Charter One Bank, braved the heat and put on a tie, not knowing he’d get on the internet for his troubles.